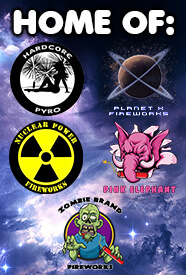 FIREWORKS SHOPPING THE INTERGALACTIC WAY.. Intergalactic Fireworks has a "Passion for Fireworks"! Our passion and appreciation of Fireworks goes back to our childhood when we first saw fireworks light up our Independence Day Holiday. I guess you can say it was "Love at First Sight"! Intergalactic Fireworks is family owned, and operated by knowledgeable Fireworks Professionals. We will educate you on what we have available for you, and how to use it correctly. We will share our knowledge of the products we sell and instruct you on how to Safely enjoy them to the Max! Not many other firework stores can give you that. During the entire year, there is always a Professional Pyrotechnician available for you to learn from! These are just some of the very important things that make Intergalactic stand apart from the rest! We are a true Pyrotechnic team that loves sharing our knowledge with You...Our Customers! Intergalactic only sells the Best Quality products from the Top Name Manufacturers. We can help you find the products you desire to light up your event. Want to Kick it Up a Notch...How about letting us design your "Show" for you based on your budget! Think of it as having your own Personal Shopper when you visit our store. We can customize it for you and you will take things to the next level for your Holiday or Event. That's one of the many advantages we at Intergalactic offer you as part of our "Passion for Fireworks"!